Each person who enters into a relationship has only one wish: that their partner might be the ultimate one. Both partners should put work to make the relationship work. However, as the relationship progresses, some things fall by the wayside for a lot of reasons. It might be a realization that both are not meant for each other, or that things simply didn’t work out. People grow and change at different pace and sometimes you and your partner can grow apart. Breaking up from a relationship doesn’t have to necessarily mean that someone is a bad person it could just mean that both of you don’t fit together very well anymore. When things mess up, just see it as a stepping stone that prepares you for a much better one that’s coming your way. 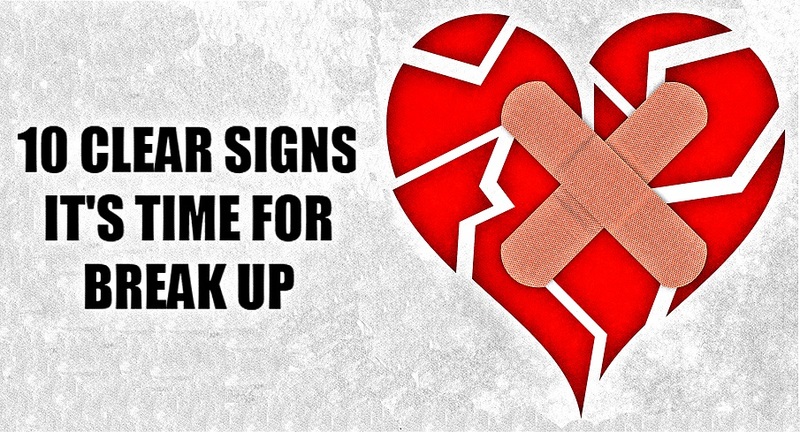 But before you call it quits just make sure the signs you are seeing are the ones that suggest it’s time to let go, and not just a part of the ups and downs that each couple normally go through. When you see these following signs, pack your things up and move on. It’s best for both of you! 1. You always carry the blame. In a healthy relationship, both partners are willing to straight out any misunderstandings that occur between them. If your partner is not willing to work things out with you, instead, puts all the blame on you, it’s a sure sign that your relationship is on hot waters. To save yourself from always carrying the blame of all the relationship’s problems, accept the fact that it’s time to get yourself out of that situation. 2. Things don’t seem to get better. Highs and lows in a relationship are normal because that’s the nature of every human. Some days we have less tolerance, some days we are just angry, sad, irritated, some days we are happy. Hormones affect us and emotions shape our reality. But if there’s no sign of any light at the end of the tunnel, it simply means you have to move on. Once the relationship isn’t getting better, for a long period of time, you have to think twice. That’s not normal, so it means there is another problem that festers. But if things don’t seem to get better and none of you know what the problem is, it might be that the two of you just don’t have a good chemistry anymore. 3. You find yourself fantisizing other people. If you’re with the right person, you wouldn’t catch yourself fancying the cute guy you saw at the grocery store or the pretty girl you meet at the mall more than them. Of course, a little fantasy here and there is completely normal. However, those are just fantasies and your partner always comes first. But finding yourself developing a romantic feeling for your co-worker is like cheating on your partner emotionally. If you can’t give your all in the relationship, you better open that up to your partner because they, too, deserve someone better who can give them first place in their lives. 4. You no longer feel things to be right. When things no longer feel right, you need to listen to your instincts. If you feel your partner no longer feels as the person you want to spend the rest of your life with, you’re probably right. When you find that trying to love them and be as close to them is already a struggle, it’s a sign that the relationship is a burden to you. Give time to listen to your gut feeling more and less on how your mind reasons it out. Relationships are meant to make both of you more than you are by yourself, and if a relationship makes you less than who you are, if a relationship is a struggle for you, than there is nothing else to reason out anymore. 5. The spark is gone. Every couple goes through the ups and downs in a relationship, especially when both of you are busy with your own life that you overlook your physical connection. It’s normal for this to happen, that’s when both of you need to try and spark things up again. But when you’ve turned into ‘just friends’ or simply roommates, and you sense that the sexual chemistry is gone without any sign for it to come back, that’s your signal that it might be over and you should leave that relationship. 6. The people around you hardly accept them. This is a red flag when most or all of the people who are important to you can’t seem to accept your partner. In rare cases they might be wrong, and you should always listen to your intuition. But in most cases, when many people, especially people who love you, don’t like someone there is a good reason. Don’t turn your back on the people who love you unconditionally and want only for you to be happy. A relationship is not worth that. Consider dropping the relationship off when the person is bad news for people around you. 7. The goodness is no longer there. When love is present, so is goodness. Goodness is generally what makes a relationship thrive. It is expressed through kindness and goodwill toward each other. Goodness appears in many forms. It’s the willingness to forgive the flaws and mistakes of the other, the tolerance you show for their annoying habits, the support, admiration, respect, dedication, and commitment. When goodness is waning, it doesn’t disappear over-night. It disappears gradually for some obscure reasons. If you wake up and find your partner being irritable, angry, distant, mean, and mostly, lacking respect, it’s time to talk with them. Maybe they have a problem you don’t know of. If they don’t want to communicate, what’s the point of having a relationship. 8. They no longer respect you. A person reveals their true character and true feelings for you with the way they treat you. Loving you involves doing everything to give you respect. But when disrespect creeps in, and you catch them lying, insulting, or even cheating, that’s your signal to break up. Your feelings or the impact of how they treat you is no longer their concern. If you have doubts about it, open the matter with your partner. If they change their behavior, then they’re still into you; but if there’s no effort on their part to change, it’s time to go. 9. You’re trying hard enough. To make the relationship work, both partner would exert an effort. When you find yourself trying hard enough to get your partner come to you, consider taking a break from such a role. If they make an effort to get where you are, you may re-align the relationship; but if they’re drifting further away, they might not be coming back. 10. It’s all about the other person. A balanced relationship is where both partners have enough space to grow and evolve. Both their interests are acknowledged and considered. In a relationship where only one person is given the opportunity to expand oneself while the other one is left out, it creates resentment and feelings of being used. If you feel this way, tell your partner about it. They will understand if they care; but if they get upset, it’s time for you to give some space for yourself and find a place where your needs are met.